States have discretion in releasing details such as party affiliation and voting history, and lobbyists, campaigns and activists each pay $2,200 to access Maine's voter rolls. AUGUSTA –– Maine has joined dozens of states in refusing to share personal voter information with President Trump’s voter fraud commission. But the state regularly sells the very same data to political parties, candidates and ballot question or issue-based political action committees. The state also provides data in its Central Voter Registry database at no cost to the federal court system, other government entities such as school district administrators, and academic researchers. And while voters can get their own information, the data is not otherwise available to the public. Under the state’s open records laws, only government and a narrow group of other entities that must pay a fee are given access to the CVR data. The going price for a statewide list of Maine’s registered voters is $2,200 – if you are among the eligible few allowed to purchase it. In 2015 and 2016, the state sold the list not only to Republican and Democratic Party officials but also to lobbyists, candidates and activists working on political campaigns or ballot question initiatives. A review of records obtained by the Portland Press Herald/Maine Sunday Telegram under a Freedom of Access Act request shows that CVR data was sold or given away 61 times over the two-year period. Only one formal request for voter data was denied by Maine Secretary of State Matthew Dunlap, who has broad discretion over the release of the data. Dunlap, who serves on Trump’s Presidential Advisory Commission on Election Integrity, could release portions of Maine’s CVR data to the commission. However, he said he won’t do that because he is concerned that the commission, under federal law, may not have the authority to keep the data confidential. The state already releases CVR data to the federal government, including to law enforcement agents and the federal court system when it is requested for assembling jury pools. But Maine’s ability to police the use of CVR data once it’s in the hands of parties, candidates and others is limited. In 2014, a group calling itself the Maine State Voter Program sent postcards to Maine addresses claiming to show whether a voter’s friends and neighbors had voted in past elections, with a veiled threat that the recipients could also be exposed if they didn’t do their civic duty and vote. The tactic, known as voter shaming, is seen by some as a legitimate way to promote voter turnout and by others as a form of voter intimidation. The organization, which sent out similar mailers in Alaska that year, had no physical footprint in Maine and appeared to be connected to an Ohio-based organization. How the sponsors of the mailing got their hands on Maine’s CVR data, including the addresses and voting participation records of voters, was never determined. Dunlap acknowledges that it could be difficult to learn or prove whether someone who is legally entitled to the data covertly provides it to someone else who shouldn’t be able to access it. Maine’s voter database was created in 2006, as a response to the 2002 passage of the federal Help America Vote Act, a sweeping law that created uniform standards and procedures in all 50 states. Among other things, the law mandated that states create a centralized database to track changes in the voting population. But while the federal law sought a uniformed voting system, it set no clear standards as to how voter data would be handled. As a result, each state creates its own rules about data access and cost. Some states make it easily available to public for nearly any use while others limit the use of voter data and only allow its release to political entities or government. Data fees range widely, with some states making it available for free while others, such as Arizona, charge as much as $32,000 for a copy of a statewide voter list. 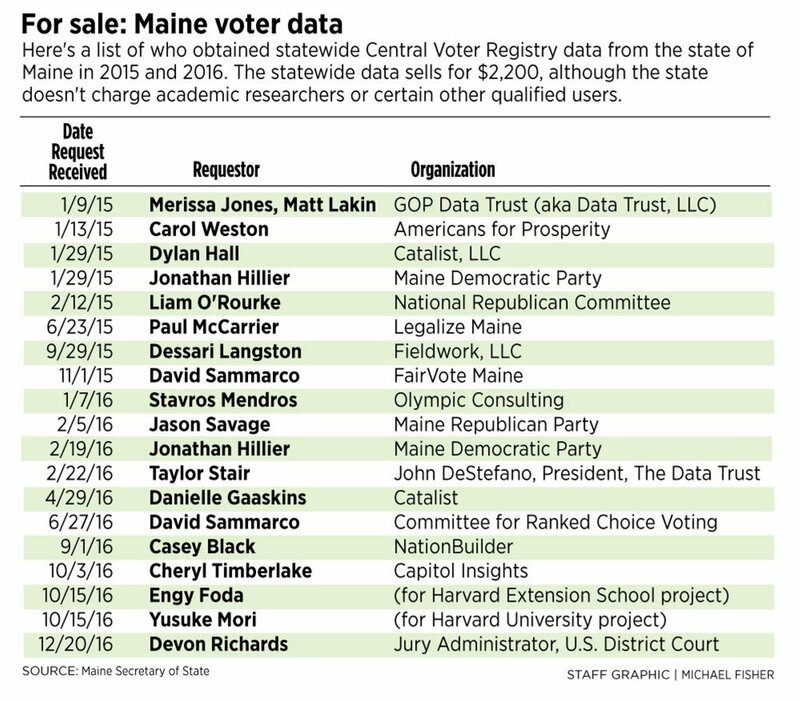 When Maine established its database, the Legislature decided to make its statewide voter data available only to political groups and government agencies. Statewide data costs $2,200, while smaller data sets cost less. The money collected is used to maintain and update the database as voters enroll and others move. Dunlap said lawmakers exempted the database from the state’s open records law in part to protect Mainers’ voting data from being used for commercial purposes. However, the line between political and commercial use can be a blurry one. For example, in 2016 the state sold copies of the statewide CVR database to lobbyist Cheryl Timberlake and consultant Stavros Mendros. Both were working on a signature-gathering campaign for a ballot question that, if approved, will give one Las Vegas developer the right to build a casino in York County. Prior to the creation of the central database, political organizations had to visit each of the state’s more than 500 municipalities and townships to compile statewide voter data. In fact, the information about individual voters still resides in city and town halls and is available to the public. Your neighbors can look up your voter participation if they want. The limits on public access apply only to the aggregated database of Maine voters – the form in which it has the most value to political or commercial entities. The statewide CVR list is a crucial basis for other “enhanced” voter lists that are developed by campaigns or parties. These lists, often using other publicly available records, or from information gathered by volunteers canvassing specific areas and interviewing voters, are then used for a variety of strategic political purposes. Jason Savage, executive director of the Maine Republican Party, said that without the underlying statewide voter list, other types of campaign tools and road maps would be more difficult to develop. Savage, who purchased the CVR database for the Maine Republican Party in 2016, said his party doesn’t ever sell any of its voter lists and doesn’t share voter data outside of Republican candidates or other campaign efforts. He said both major parties have developed their own voter databases from various sources over time, and that candidates have access to that information. “And there is a lot more data that is available now than ever before that voters (voluntarily) give the parties as well,” he said. The party shares the voter data with all of its wings, such as caucuses, county and municipal committees, he said. Savage said it’s unclear to him why Dunlap has been so reluctant to share CVR data with the Trump commission, unless the registry contains other data that’s not released to parties and candidates. Democrats, not surprisingly, have a different view. “The voter information that the Trump sham commission requested went way beyond what a government entity is entitled to access, including personal information like social security numbers,” Rogers said. Others who have purchased Maine’s statewide voter list include Paul McCarrier, who worked on the citizens’ initiative to legalize recreational marijuana in Maine in 2016. He said his organization used the voter list primarily as a way to check the volume and validity of voter signatures on its petitions. 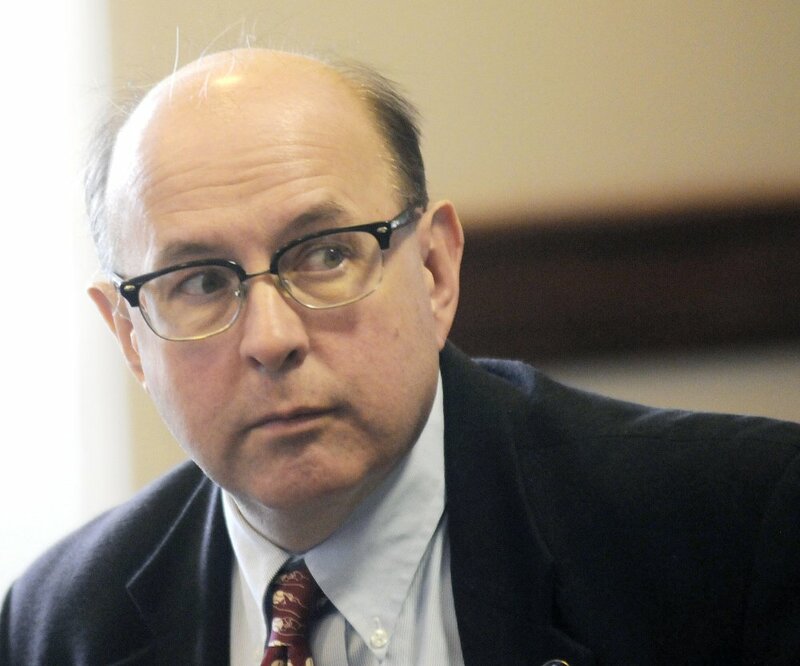 Dunlap said the sale and release of voter data is strictly limited under Maine law, and he questions whether the Trump commission could withhold the data if it received a federal public records request. He said last week that until the commission sets specific goals for what it hopes to achieve and establishes clarity as a group on how it intends to protect voter privacy he won’t release data in the state’s registry to the commission. Dunlap said the federal Real I.D. law, which Maine had resisted complying with until this year, provides far more personal data to the federal government than anything in the voter registry. But Dunlap said the public is far more passionate about protecting the information in their voter registration files. Dunlap said he’s unsure why Trump’s commission wants so much voter data, but he suspects it is looking for instances of the same person being registered to vote in two different states, which in and of itself is not against the law – provided the person isn’t voting in both places. The commission’s leaders may also be looking for people who shouldn’t be registered to vote in the first place, although in some states voters have become so reluctant to have their data shared with the commission they are asking to be removed from their state’s voting rolls. Myrna Pérez, deputy director of the Democracy Program at New York University’s Brennan Center for Justice, said voters have reason to be leery. She said the dispersion of voter data and divergent laws among the 50 states provides a measure of insulation against widespread fraud or misuse of the data. A centralized federal voter database would be a rich target for those who may want to disrupt or corrupt American elections. “If it’s all combined and included in one, that immediately incentivizes making this the one target, because it becomes more valuable and has a higher payoff if you are able to get through,” she said. Pérez also worries that once the commission has voter data from all 50 states it won’t be able to fully protect it in a way that complies with the standards for public access adopted in the various states. The center is suing the federal commission in an attempt to ensure that the various state protections for protecting the privacy of voter data are complied with, she said. Pérez also said it seems unrealistic to expect that voter data released to legitimate political users isn’t going to be shared with others who will use it for unauthorized purposes. She said policing the transfer of data would be virtually impossible, given that states regularly sell the data to a wide variety of customers. Some, including Andrew Smith, a political scientist who has done numerous political polls for the Telegram as director of the University of New Hampshire Survey Center, said Maine may want to consider loosening some of its constraints on voter registry data. From a pollster’s perspective, Smith said, there are pros and cons to the data. Smith, originally from Ohio, said his home state makes voter data broadly available to researchers, parties, candidates and the general public as well. Most of Ohio’s data is available for free, although the state does prohibit its use for commercial purposes, as does Maine. Smith said public access to that data in Ohio has seldom been controversial or dramatically misused. For now, access to Maine data will continue to be limited to selected categories of users. The one application for Maine’s statewide database that was rejected in the last two years came from a Nashville-based company, icitizen Corp., which builds mobile applications aimed at improving voting participation and engagement and connections between elected officials and their constituents. The company requested Maine’s data for an application that allows voters to see if they are actually registered to vote and, if not, provides them with state-specific instructions on how they can become registered. In a letter to icitizen, Maine’s database manager, Tina Means, said the request was turned down because the app wasn’t really a get-out-the-vote mobilization effort, which is one of the approved uses for the data. Means also said the CVR database is constantly being updated, so a point-in-time release of data through the app could result in a user getting inaccurate verification information. “Such verification is an election-administration function that may only be performed by election officials,” Means said.